In actual circuit, there are several resistor design parameters to take note to avoid stressing the device and to improve the design reliability. Most of the times a typical circuit designer only considers the nominal parameters and values in their design. Yes the circuit will function normally. However the question is, will the design sustain continuous operation or the entire product life? Maybe yes but most of the times it is not. In this article I will discuss the resistor design parameters to consider to ensure a robust design. The dissipated power of the device should always be less than the power rating of the device to prevent burning or damaging it. A good rule of thumb is to set the power dissipation to just 80% of the device power rating. Operating beyond 80% will accelerate the aging of the device and might fail in the field. Resistor comes in a variety of power ratings. This rating is actually depends on the physical size of the device. The bigger the size, the bigger is the power rating. For a surface mount resistor the power rating is available from less than 100 milli watts to few watts. For a through-hole type, it has somewhat higher power rating than the SMD type. If we say power rating, this is the typical or nominal value the component can deal with, which is most of the time taken at nominal ambient temperature and other normal conditions. The actual power dissipated of a resistor must not exceed this rating to avoid damage. Any device once exposed to an extreme heat will degrade its performance so as resistor. Most resistors will start to degrade their power capability at operating temperature higher than 70°C. Therefore at this temperature the power rating is no longer at 100%. Resistor manufacturers have provided a graph on the datasheet containing de-rated power versus the operating temperature. Figure 15 – Sample power de-rating curve of a resistor. Usually a resistor power dissipation capability will start to degrade from 70˚C which is higher than semiconductor devices which started to de-rate at temperature above 25˚C. For small signal circuit or applications, this rating is often neglected since by default the rating of the device is very much higher than the circuit supply. However, on applications involving high voltages such as in the PFC section of a power supply or the ladder resistors design to detect ac input line, this should be highly regarded. The key is not to exceed this rating to avoid damage. As a rule of thumb, the maximum voltage experienced by the device should be only 80% of its voltage rating. The given resistance value is the typical one and still subject for variation due temperature, aging and other factors. The parameter that gives as idea on how the given value changes with these factors is the tolerance. The information regarding this is stated in the component’s datasheet. Nowadays manufacturers are offering precision resistors in which the tolerance is very small (less than 1%) to cater mission critical designs such as in automotive, military, space and medical. For general purpose designs, the usual tolerance ranges from 3% to 10%. To compute the minimum and maximum tolerance, below equations are useful. A resistor has a typical value of 1000 ohms with a tolerance of +/-10%. What are the minimum and maximum values? A simple circuit consisting of a 2-watt 100Ω resistor and a supply of 10V is exposed to an ambient temperature of 100°C. 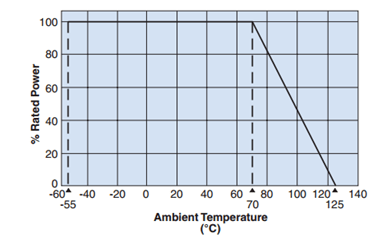 According to the datasheet of the device, the rated power will start to decrease linearly after 70°C ambient temperature and eventually goes to zero at 155°C. What is the power stress of the resistor? The rated power of the resistor is 2 watts. This rated power is valid only up to 70°C. Since the operation is defined at 100°C, we will get the corresponding power capability of the device at this temperature. Since the decrease in power is linear, we can use here the same triangle method. From the supplier’s datasheet, the power de-rating curve is included and you can directly project the resulting power capability without doing computations. Higher device stresses will wear out a device in the long run, so it is advisable to limit the power stress to around 80%. Resistor voltage stress is not critical in small signal circuits since the supply voltage is only small and by default resistors are rated with somewhat high voltages. However, in application which deals with high voltages such as the divider feedback of a PFC circuit or AC detect circuitry; this must be limited to around 80% to avoid wearing out the device in the field. The most common failure of a resistor is open circuit and sometimes changed in value (although it cannot be taken away the possibility of having a short circuit by physical means). In a complex circuit, the state of a resistor whether open or changed in value is cannot be immediately found out by doing in-circuit measurement. It is advisable to remove the part from the circuit first then do the measurement.